My birthday is this week--Friday the 28th. I'm kind of in a funk, so not feeling terribly celebratory (nothing terrible, just life and stuff). It's my 57th (eek!) so not really a big deal. Other than a traditional lunch with a couple of friends, one of whom has a birthday on May 2nd so we always do a group thing, I'm not really observing it at all. Which seemed kind of sad, so I decided to celebrate with all of you the same way I did last year: by giving away a gift to someone else! A signed tarot deck with a limited edition tin, plus a broom pen. A set of all three Baba Yaga books and the first Broken Riders book, all signed by me. A cute stuffed dragon, a broom pen, and the signed book of your choice, fiction or nonfiction. And really, you don't have to buy one of my books to help me celebrate, although you know I'd love that. Just fill out the Rafflecopter form below. As always, no purchase is necessary to enter, and you can get credit for things you have already done, like following the blog or following me on Twitter. Spread the word, since it's a party! I'm looking forward to spending the next year with all of you. VEILED MENACE IS OUT TODAY!!!! Have you gotten your copy yet? Be sure to enter the contest HERE at the blog. I'm giving away a Kindle Fire HD Tablet and a $10 Amazon gift card! And check out the exclusive excerpt of the first chapter and a fun giveaway at Literary Escapism, plus a guest blog and giveaway at Fang-Tastic Books. Haven't picked up a copy yet? What are you waiting for? 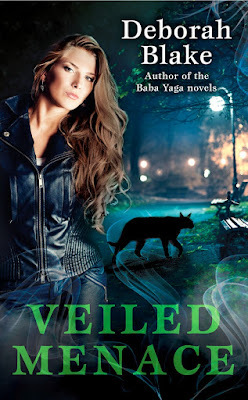 Holy crap--how did it get to be a week before the release day for Veiled Menace already? First winter was lasting forever, then spring finally showed up, and now we're almost to release day, April 18th! I love this cover sooooo much! If you've been hanging around this blog for any time at all, you know what a book release means--GIVEAWAY!!!! Check out this cool bunch of goodies I've put together for you this time. There's a notebook, postcards, and a magnet with the cover on them, a cute stuffed dragon (I just love these little guys), a broom pen, chocolate, and a $10 Amazon gift card so you can buy yourself a copy of the book to read. In fact, since it is only $4.99, if you haven't bought VEILED MAGIC yet, you can get them both! As always, all you have to do is fill out this simple Rafflecopter form. And yes, you get to take credit for things if you've already done them in the past, like following the blog or following me on Twitter. Have fun, and be sure to come back the day before the book comes out for the BIG giveaway! Many of you know that Mystic, the brother of Magic (and son of Minerva, who I lost March first a year ago) hasn't been doing well. 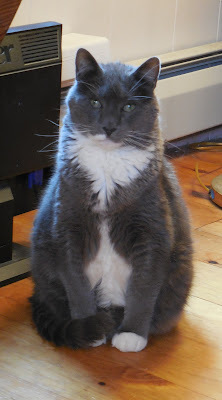 As far as my vet can tell, it is a flare up of his continuing digestive issues (he has the kitty version of irritable bowel syndrome, poor boy). He's lost a lot of weight--although he's still a large cat--and doesn't have much appetite, which is unusual for him, to say the least. He's on prednisone and special food, but he clearly still doesn't feel well, and I'm spending a lot of time trying to get him to eat more. Still, he mostly acts like a healthy cat, and we haven't found anything dire (although it is always possible we're missing something), so I'm trying to stay positive. Mystic now. Yes, he's standing next to a box of tarot decks! So mostly, we're doing the best we can and hanging in there. I'm working on Veiled Magic #3 and getting ready for Veiled Magic #2 (Veiled Menace) to come out in a little over two weeks! And waiting for that silly giraffe to have her baby.